Aloha friends! Our hawaii vacation has been amazing so far. Yesterday we traveled the Road to Hana and hit the beautiful black sand beach….it was truly incredible! 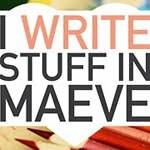 We already have had some amazing Guest Posts including the Vintage Master Class with my stylish mama, a fantastic edition of Alix’s Vintage Bookshelf with Jenny of Frecklewonder and some tasty snack action from Shutterbean! This afternoon I am super thrilled to have my amazing friend James guesting. James has two stunning kiddos and an adorable little baby. 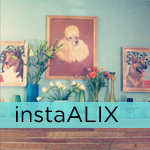 She’s also the stylish proprietress of Bleubird Vintage! 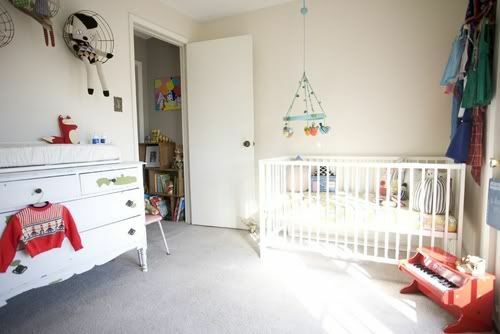 I loved her little bebe’s nursery space and was delighted when she offered to share it with you guys. I just know you’ll love this sweet space too! 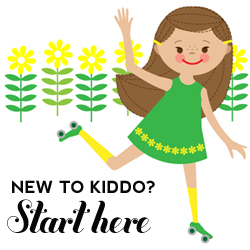 hello modern kiddo readers! 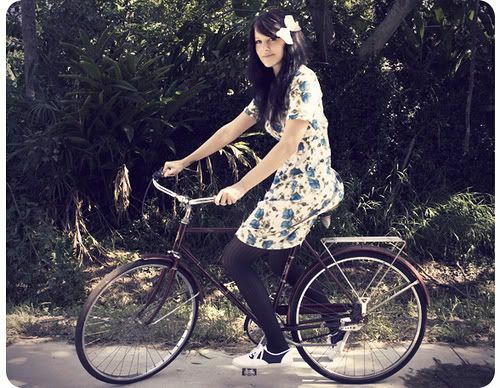 this is “miss” james kicinski from bleubird and i’m a lean mean vintage lovin’ machine from texas! 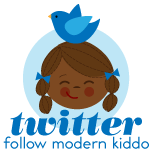 i am the owner and stylist of bleubird vintage and a proud mama of three adorable little kiddos. 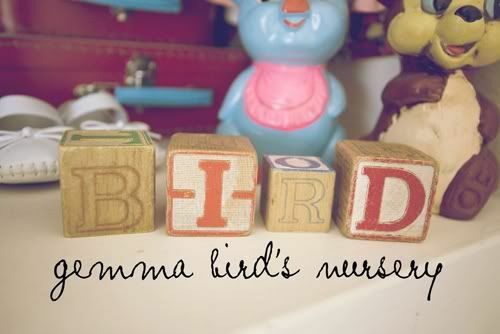 i am so excited to share with you photos of my little birdies nursery. i adore the way it turned out (shh! don’t tell the older kiddos but it’s my favorite room in the house right now. hee!). 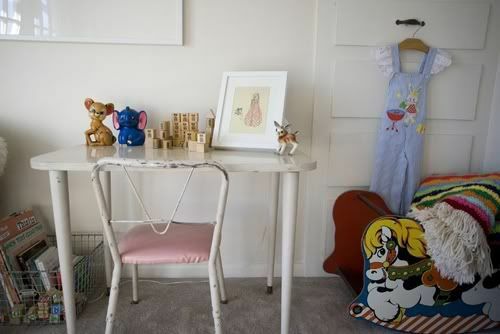 the room was originally my sewing room but once we found out we had a new little birdie on the way it was time to move the fabric and machines downstairs and transform it into a tiny girls room. the space is quite small. i’m not sure what the square footage is but trust me it’s teeny tiny, but perfect for a small child. there is also no closet so i had to get creative when it came to storing her clothes. it was a challenge to make everything fit and not look cluttered, but one that i was excited to take on. 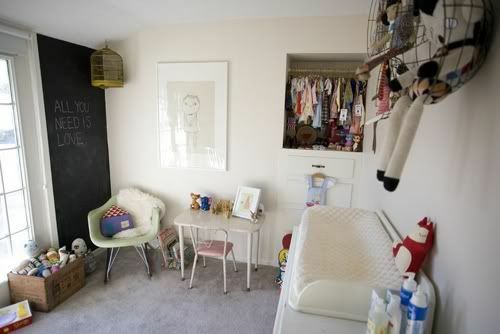 so here you have it…baby gemma bird’s nursery! i drew inspiration from everywhere i could. it’s a little bit vintage, a little bit mid century and a little bit shabby chic, i suppose. 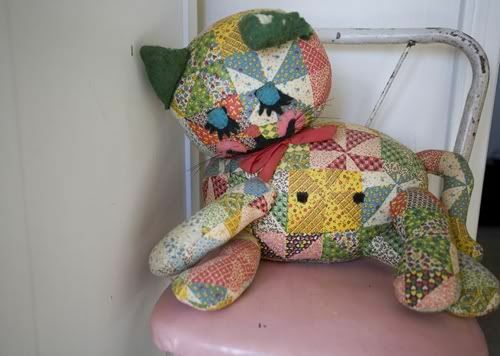 i also wanted to add a lot of color with accessories, knit toys, stuffed & handmade dolls. 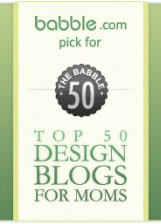 i read a lot of the design blogs that featured other nurserys to collect inspiration. most came from european homes, they love color and had some really great ideas which i incorporated into the room. 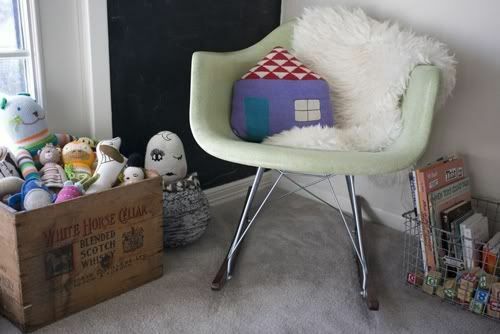 i really wanted this fiberglass mid century rocker and had put it on my baby wish list way back when i was gathering inspiration for the space and was so pleasantly surprised when modernica gifted it to me for baby gemma’s nursery. that was the happiest day! both julian and milla plum have chalkboard walls in their rooms so of course i wanted to give the bird her own little wall to doodle on. 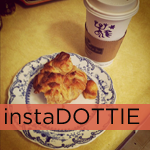 i used a lot of antique store finds for storage. 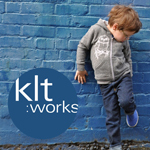 wooden crates, wire planters and baskets to store toys, books and blankies. as i said earlier the room had no closet so i had to create one. there was a built in dresser in the wall with a cubby hole above for a television (i’m assuming) so we bought a rod and hung it inside… voila instant tiny closet. 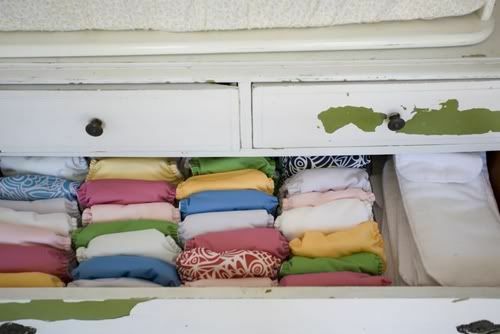 the drawers beneath are packed with clothes as well as on the wall above her crib. i hung some of her vintage dresses there and it not only gave me a bit more closet space but also looks pretty cute. i have quite the collection of little vintage dresses for her. many are in our closet as well because i ran out of room. 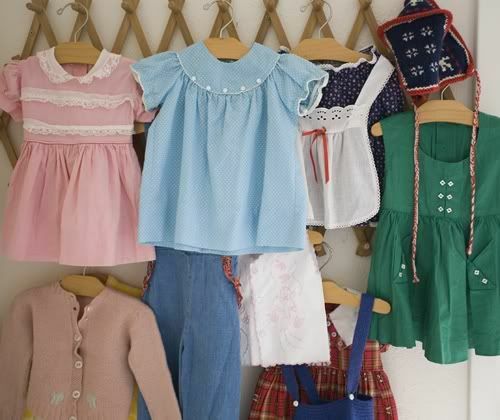 many of these dresses & clothes were sweet gifts from blog readers and friends. i love them all so much! 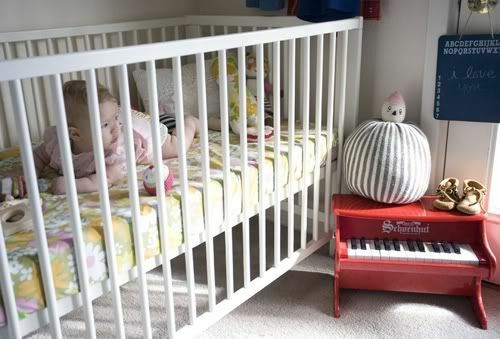 her little crib is full of lots of hand crafted knit toys. i made her sheets from vintage linens and a little pillow out of doilies from my friend rachel’s diy. we picked up this tiny formica table and chairs set at an antique shop here in texas on one of our summer road trips. i imagine her having cute little tea parties there one day. 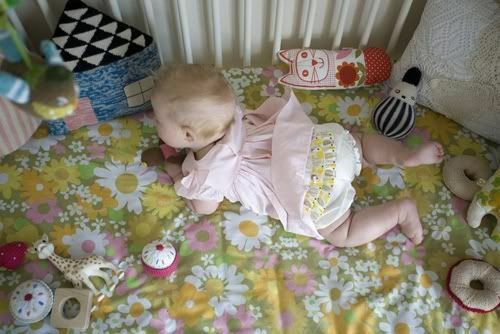 her changing table top and dresser were actually her big sister milla plum’s when she was a baby. she was happy to pass it along to her baby sister because she got a new bigger and taller dresser. 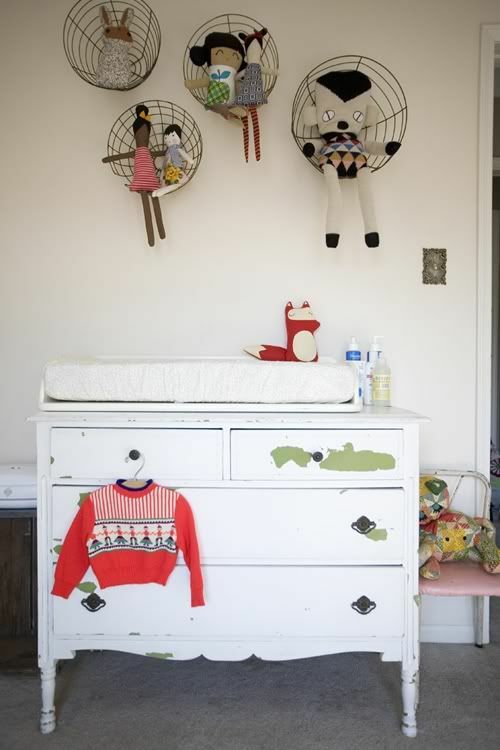 i hung wire planters above the changing table/dresser and filled them with handmade dolls by mama, sleepy king, warm sugar and a peppe doll from luckyboy sunday. a cute idea that i found from a design blog. i love the way it turned out. there’s lots of love in this room and i am so so smitten with how it turned out. 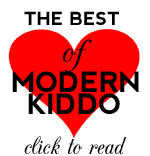 thanks for taking a look, modern kiddo readers! XO! Thank you so much James! 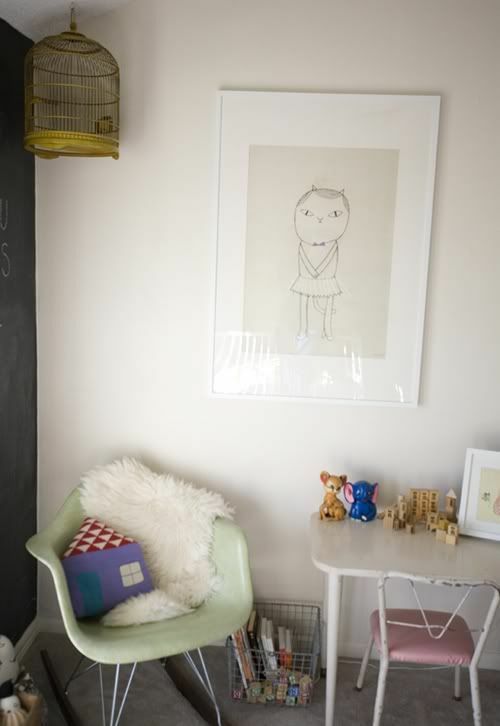 This is such a sweet little nursery…I love the mixture of quirky vintage and warm modern. It’s so cozy! But my favorite part of the nursery? That sweet little baby gemma! Fab! 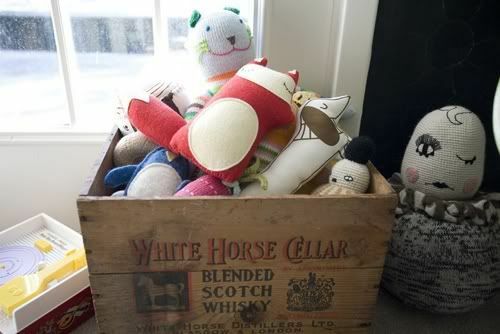 I love the crate for the toybox–might just steal that idea! 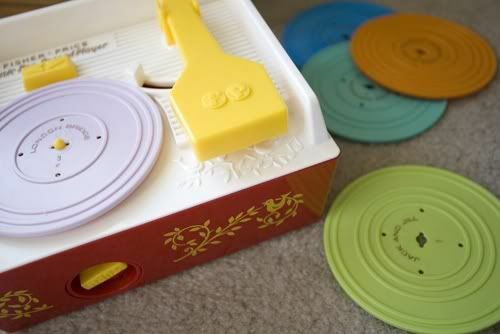 Oh my goodness where did you find that little baby plastic record player!! I’m sure I had one of these..for some reason it has tugged hard on my nostalgic heart strings! 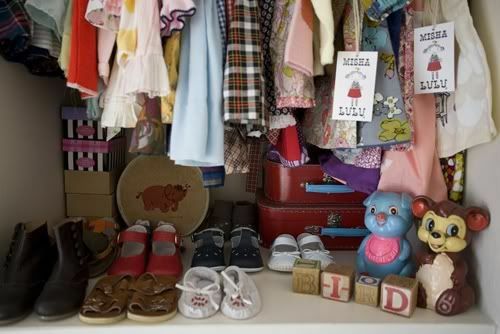 OK–I’m in love with so much in this nursery, it is hard to pinpoint just one thing–OK–I LOVE THAT BABY MOST OF ALL! That is one super cutie patootie baby. But I also love the wire plant hangers to hold the dollies. Genius! And will be stolen my me! Hee hee! Oh and the vintage crib sheet–yummy!